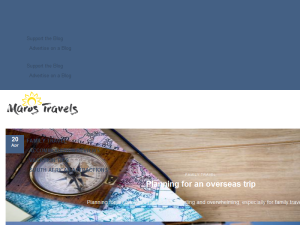 This what your Maros Travels | South African Family Travel and Reviews Blog Ad will look like to visitors! Of course you will want to use keywords and ad targeting to get the most out of your ad campaign! So purchase an ad space today before there all gone! Delayed Flights. We all have had an experience where we had a delayed flight some time in our lives. It causes a lot of anger, frustration and confusion. In this article, I share the 3 main reasons why flights are delayed and what you can do next time you have another delayed flight. This is probably the most common reason why flights are delayed. It is extremely dangerous for an aeroplane to fly during thunderstorms, snow storms or bad visibility. Airlines are able to predict weather patterns by using mostly radar and weather charts. If they do notice bad weather (thunderstorms or snow storms) on their flight plan, they will delay the flight. Before any airplane leave for a trip, the pilot performs an outside inspection. They have a checklist of things that they need to check and they do this before every single flight. If they do find something out of place during their inspection, they need to contact their engineering team. If the faulty part is an easy fix, the engineering can fix it quickly right there on the tarmac. However, if the faulty part is not available at the engineering facility at the airport, it has to be flown in from another airport/city and this can cause a flight to be delayed. ATC might order the pilot to circle airspace about the airport until the weather has cleared for landing. Should this be the case, the pilot will prepare the aeroplane for landing. ATC might order the pilot to divert to another airport should there be no indication that the weather is clearing. Delays will also occur when there is restrictions on the runway at the airport where the aeroplane has to land or if the runway is closed for any reaon. Again, ATC might give the pilot either one of the 2 above mentioned orders (ie. either circle the airspace above the airport until the runway has been cleared or opened or diver to another airport. Based on the above 3 causes for delayed flights one can clearly see that delays are there for your own safety. An airline will never just delay a flight for no reason. Delays causes airlines tons of money so they will try everything in their power to keep the flight on time. However, things like weather, mechanics and poor visibility is out of anyone’s control. When a flight is delayed there is very good reason for this = SAFETY. Like I’ve mentioned in the start of this article, we all get frustrated, angry and irritated when we discover that our flight is delayed. I’ve seen a lot of passangers taking there frustrations and anger out on the poor ground staff, gate staff and even the poor crew members. Firstly, know that there is absolutely nothing that they can do. A delayed flight is totally out of their control and the info that they give you, is what they know. The best that they can do is to keep you informed, make sure that you are comfortable and a lot of airlines provide meal vouchers if a flight is delayed for more than a certain amount of time. The best thing you can do to help yourself and the situation is to take a deep breath and just realise that this is part of life and that you will make the best of this bad situation. Get yourself comfortable, read a bood, watch a movie, get some coffee or something to eat and just “chill”. I know this is easier said than done, but try and teach yourself to just relax and go with the flow. If you have some other tips that you want to share of what you do when your flight is delayed, please do so by leaving a comment down below. If you find this article helpful, please do share it with your friends and family and be sure that you sign up for my newsletter. You can also go check out my YouTube Channel. The post Delayed Flights appeared first on Maros Travels. The post Packing for a Family – Tips and Tricks appeared first on Maros Travels. As parents we always want to keep our children healthy. We are always looking for healthy snack ideas when out and about or ever travelling little ones. We’ve asked 8 mom’s to give us some of their healthy snack ideas. Lauren Henry is a mom of 2 girls, ages 4 and 1 years old and her girls loves fruit, rice cake snacks and rice crackers when they are out and about. Dee Berry is a mom of 2 boys, 11 and 5 years of age. She says her boys love boiled eggs, but add that you need to keep them in the shell till your child is ready to eat them, but be conscious not to carry them around in warm weather for more than an hour or so. Other goodies her boys love, includes mini corn, cheese wedges and carrots make great snacks too. Denise Neethling is a mom of a girl, age 23 months and soon to be mom to a boy. She says that Lea likes ProVita’s, Rusks, Banana, Purity Fruit Drops, Droëwors, Rhodes Fruit Squash, Dried Fruit Roll, Yoghurt and Mini Cheddars. Shelley Swart, mom to a boy, age 6 years, says that when Connor Jo was little, she used to pack things like Purity or Squeeze pouches, fruit juice, mini cheddars, a packet of raisins, rice cakes or the Veggie Biscuits from Woolworths. If they go out over lunch time, she use to take frozen blocks of veggies or food and just heat it before they have lunch. Now that Connor Jo is much older, she packs a small bottle of water, banana, container of grapes, cheese or peanut butter sandwiches and a small packet of chips/crisps. She also mentioned that recently, Connor Jo started to nibble on cucumber – without the skin and corn. Chanel Schonfeldt, mommy to a busy 1 year old girl, says that they love road trips so it is very important for her to have healthy snacks handy, which includes Drinking Yoghurt, Fresh Fruit, Sugar Free Muffins, Granola Bars and fresh, steamed veggies. Claire Butterfield, mom of a girl, 6 years old says that she use to give Leah Popcorn and to make it fun, she would add a small drop or two food colouring. She advise that use a plastic shopping bag as the food colouring stains everything. Meagan Hillman is a mom to 2 girls, 8 and 6 years of age and she likes to pack things like viennas, oat meal snack cakes, cucumber, cocktail tomatoes, Carrot Sticks, Yoghurt, Crackers, Cheese, Mini Puff Pies from Woolworths, Muffins, Bananas, Strawberries, Mini Pizzas, Celery Sticks or kebab sticks with chicken. Johané Matthee, mother to a girl of 7 years old, shares that Tiané loves frozen fruit on a hot day, especially grapes. She also loves infused ice water and added that rice cakes with peanut butter and cheddars is always a winner. Well, there you have it. Don’t know about you, but we certainly got a whole lot of new ideas from these mommies. We would just like to extend a warm thank you to all the mommies that was willing to share their ideas with us. Thank taking the time to share your insights with us. We certainly a whole lot wiser. If you have any healthy snack ideas that you would like to share with us, please do leave a comment with your suggestions. If you know of any mommies that would find these ideas helpful, then please do share it with them. If you want more of these helpful tips and more, then please make sure you follow the blog on any of our social media platforms. You can also sign up for our newsletter. The post Healthy Snack Ideas when Traveling with the Little Ones appeared first on Maros Travels. Planning for an overseas trip can be daunting and overwhelming, especially for family travel. I live by the following quote from Saint Augustine: “The world is a book and those that do not travel, read only a page”. I cannot agree more with this quote. Being able to travel to other countries is such a privilege and something I really believe everyone should do. In this article we’ll share some of our tips on how to make this daunting task, a fun and exciting experience. Getting a passport is first on our list as you cannot travel internationally if you don’t have a legal passport. Even if you don’t know where you are wanting to go yet, get your passport done as this is the first and very important step towards your plans to travel. When applying for your passport, in South Africa it is R480.00 and can take up to 6 – 8 weeks for the Department of Home Affairs to issue you with your passport. Bear in mind that if you are going to travel with children, each child require his/her own passport and will be charged the normal R 480.00 per passport. Another thing to remember when applying for passport for a child, you need to present an Unabridged Birth Certificate, that contain both the mother and father’s details. Before you travel, make sure your passport is valid for at least another 3 months AFTER you arrived back in your home country. Also, before you book your tickets, check when your passport expire. If you need to renew your passport, make sure that you do so before you continue with your travel plans. If you do not know yet where you want to go, I would suggest you first make a bucket list of all the countries you would like to visit. This will depend on what type of holidays you prefer, city or beach. Do you like history? Do you like to experience the culture? What type of whether to you prefer? All these elements will play a huge role in your decision as to where to go. Some other thigs to take into consideration is budget, currencies, distance and visa requirements. This is the most important step. Once you followed the first step and you have your list you need to determine when a good time to visit is. Our suggestion is for countries like Europe, including the UK, Scandinavia and America, spring or summer is the perfect time to visit. The weather during these times are perfect as it’s not too cold neither is it too hot. Countries like Africa, South America, Australia or New Zealand, spring or autumn is perfect as it can get extremely hot in the summer with extreme winter temperatures. If you have a sense of adventure and are keen to try things you haven’t experience before, then you can visit these countries during the summer months. Bear in mind however, that you would need to consider packing things like shades, hats, loads of sun screen, very cool clothes and you need to stay hydrated. Tropical islands like the Indian Ocean Islands and the Caribbean is anytime between December to April. During these months the weather is drier, cooler and less humid. During the months of September to October is usually cyclone season, with rains starting in June. Countries like South and Southeast Asia, it’s best to visit January through to March as well as June through to September. These counties are close to the equator, which means that it’s hot and humid year-round. However, during these months they experience the lowest rainfall, which means that it’s a little less humid. When it comes to booking your tickets, you have a few options. You can either book the tickets yourself at the airline directly or you can go through a travel agency. I would recommend that you go through a travel agency, simply because they can tell you which airline would be best for your needs. Airlines often have specials and the agencies can tell you about these specials. Most of the big agencies in South Africa do the visa applications, travel insurance, accommodation and car hire as a package and usually works out a little cheaper than doing it yourself. Another advantage of booking through an agency, is knowing that should something go wrong during your travels, you have someone that can assist you. This saves you lot of time, money and stress. Travel Insurance is compulsory if you require a visa. It is relatively cheap and is usually really good cover. It covers any medical emergency, luggage, cancellation of flights, accidental death, missed connection, travel delay, denied visa, personal liability, hijack & hostage detention inconvenience and emergencies due to nature causing accidents like cyclones, earthquakes, etc. Don’t make the mistake and think that your medical aid will cover your travel insurance. They do make provision for it, but the cover is very minimal. We suggest that you get proper travel insurance through a travel agency. You can get travel insurance from any of the travel agencies listed in the previous point. If you are traveling with children under the age of 2, the insurance is usually included in the adults insurance. We mentioned in the beginning of this post, that one of the things to consider when choosing where to go, is whether visas are required. If you are traveling with a South African passport, most countries these days require you to have a visa. We did a post on Visa-Free Holidays for South Africans which contains a list of all the countries you can visit visa-free if you travel with a South African passport. If you travel with an American passport, we also did and article Countries Americans can visit visa-free. Again, this article contains a list (and a very long list if I may ad) of countries you can visit visa-free if traveling with an American passport. If you are unsure on whether you require a visa, feel free to contact the local embassy or you can also check online. They will provide you with all the info you require. When applying for a visa, for most countries you can only do so 3 months before you leave and it can usually take up to 6 weeks for the embassy to issue you with your visa. If you are traveling with children, each of the children would also need a visa at the normal visa charge..
Accommodation and car hire/travel is probably one of your biggest expense and you should expect to pay quite a bit for accommodation and travel. We recommend that if it is at all possible, to try and stay with family and friends as far as possible. If this is not possible, then you must decide as to how much you are willing to pay for accommodation. If you are adventurous at heart and want to save on accommodation, we recommend backpacking as this is by far the cheapest way to travel. If backpacking is not for you, then there are other options like hotels, B&B’s or even Guest Houses. Another great way to save on accommodation is to check out Air B&B. You can search and book accommodation by making use of the search box to your right. This will also give you an idea of pricing that will make it easier for you to budget. We suggest that you make 2 copies of all your documentation. One copy to leave at home with family or friends. This is to provide them with all your travel information, so that should something happen to you, they have all the info that might be required. The other copy is to keep with you in your bag wherever you are staying. This is to prevent you from being “stuck” should you lose the original documentation. It is important to remember that you need to have your passport on you at all times. If you travel as a family, make sure that you pack half of your clothes in your own bag and half in another family member’s bag. That way, should your luggage get lost, you at least have clothes. If you are a South African, make sure that you inform your bank of the dates that you will be out of the country. Also inform them of the countries you are going to visit. This is to prevent them from blocking your card due to fraudulent transactions from countries other than South Africa. Plan your trip. Make lists of the places you want to see and if possible, book tickets online before you go. It is usually cheaper to buy online and it prevents you from carrying unnecessary cash around. Planning your trip effectively, allows you to enjoy every moment. It eliminates trying to cramp a whole bunch of activities into the day, making you feel tired and you end up not enjoying your trip. Do research of the country/ies you are going to visit. Make sure you are aware of the laws of the country and that you understand the culture. There’s nothing more embarrassing then finding yourself clueless and in trouble. If you are visiting a country that speaks any language other than English, try and learn the important phrases in that language. It will make your trip a lot easier and fun. Before you start packing, make sure you are aware of the amount of bags each person is allowed as well as the weight of each bag as you will be charged for every kg you are over the allowed weight. Make sure you know of the dates and times of your flights. If it is allowed and you can, try and check in online before you go to the airport. This will make the process at the airport a lot quicker. Try and have fun! Enjoy your trip, make the most of every opportunity. Meet new people, eat the traditional foods, learn the culture and the history and take in the beauty each country has to offer. Take loads of pictures and build memories. Thank you for taking the time to read this article. Did you find this post helpful? Do you have any other tips that you want to share with us? Then please join the conversation, by commenting in below. Please also show the love by sharing this article with your friends and family. If you want to know when there is new articles on the blog, please sign up for our newsletter. You can also stay up to date by following us on any of our social media platforms. The post Planning for an overseas trip appeared first on Maros Travels. We were privileged to do an Accommodation Review for The Crystal Towers Hotel and Spa, a 5 star hotel is situated in Century City, Cape Town. It is walking distance from the very famous Canal Walk Shopping Center that is home to over 400 of the world’s most well known shopping brands. Spoiled with a lifetime’s worth of luxury, the hotel showcase almost 15 000 square feet of versatile, contemporary venue space and innovative planning services. With all this on offer and with an average of 4.5/5 review rating, one can understand why 90% of the visitors highly recommend you choose this venue to be your home when visiting to the Mother City. The Crystal Towers Hotel & Spa has enough facilities to keep you so busy, you don’t even have to leave the hotel. Facilities includes a guest lounge with fire place, sushi and cocktail bar, the Tower Restaurant, The Deli and the ever famous Ruby Bar, Pool and Health Bar, Business Center and the Life Day Spa. If you are looking for fine and sophisticated dining, The Towers Restaurant is the place to be. The restaurant is divided into 3 sections, including a romantic private area and offers carefully planned menus of intercontinental and fusion flavours. The Towers Restaurant is open for breakfast, lunch and dinner and dress code is smart casual. The 24 hour delis is ideal for getting some business done or having a quick bite in a casual atmosphere. Open for breakfast, lunch and dinner. Dress is casual. Should you be in the mood for an exciting night out, than be sure to pay a visit to Ruby Bar. This double volume bar is fully stocked with an extensive collection of imported champagnes and single malt whiskeys. Complimentary bar snacks are on offer. If you are looking for something more intimate, be sure to escape into the private bar lounges, decorated in honour of South African legends Kingsley Holgate and David Kramer. Open for dinner only. Dress code is casual. Decorated with pure white furniture and high volume doors that open up to the beautiful pool deck the most amazing views over the city. The pool area has a health bar that provides you with a healthier alternative to your daily meals and the day beds allow you to unwind and forget about the days of trouble. The pool area serves light meals, sushi or cocktails with a clear view of Table Mountain. Open for breakfast, lunch and dinner. Dress code is casual. The Crystal Towers Hotel & Spa cater for the professional and corporate. You can be ensured to receive a Business Centre with a professional setting for executive meetings and conferences. Facilities includes large, multi-use conference venue, with state-of-the-art boardrooms, full secretarial and business services and complimentary wireless internet access. The Crystal Towers Hotel & Spa is dedicated to world class conference venues and facilities and I would HIGHTLY recommend The Crystal Towers Hotel & Spa for your conferencing. The 108 guest rooms offers something different with amazing architecture and breathtaking city views. Each room is quipped with a mini kitchenette and honesty bar. The kitchenette is equipped with coffee/tea making facilities and a fully stocked mini/honesty bar. The en-suite bathroom is equipped with a luxurious bath that overlooks the entire city. Scented candles is available for your use. Fancy a shower rather than a bath? Then the cylindrical frosted glass shower with a raindrop shower head known as “The Crystal Showers”, is just for you. The toilet is separate from the bathroom. Some of the other facilities in the rooms includes a LCD TV with DSTV, DVD player and some DVD’s. The hotel has a DVD library stoked with all your favourite award winning movies. Other facilities includes a GHD, Wii Game Console, Playstation and Board Games for in room use. The bedrooms are also fitted with an executive work desk, climate control air-conditioning, international plug point, a safe large enough to store a laptop, ample cupboard space and a hair dryer. Why would you want to stay anywhere else? I think this post speaks for itself. The only think to add is that you will absolutely NOT be disappointed with your stay here. We only spend a few hours here, but we can promise you that few hours felt like an entire lifetime. That is how much at home we felt. Spoiled for luxury and surrounded by absolutely beautiful architecture and décor, you will NOT go wrong by booking your place at The Crystal Towers Hotel & Spa. Have you stayed at The Crystal Towers Hotel & Spa? Please do share your feedback by commenting below. If you liked reading this article, please show it some love, by sharing it with your friends and family. If you want to know when there’s new articles on the blog, please sign up for our newsletter or follow us on any of our social media platforms. The post The Crystal Towers Hotel and Spa, Century City appeared first on Maros Travels. All about Knysna. Knysna is a perfect family travel destination, about 490km from Cape Town along the famous Garden Route. The route starts in Cape Town and runs all the way to Port Elizabeth, traveling through some of South Africa’s most beautiful landscapes. There are tons of beautiful accommodation along the route and Knysna is a “must stop” when exploring the Garden Route. Knysna was named one of the Top 100 destinations according to TripAdvisor 2008 Travellers’ Choice Destinations award. Knysna is lined with indigenous forests, fynbos (a distinctive type of begetation found only on the southern tip of Africa. It includes a very wide range of plant species, particularly small heather-like trees and schrubs), lakes, rivers, mountains and beautiful coastlines. With its very moderate climate, Knysna is the natural Eden of South Africa. Knysna is also known for its annual Oyster Festival (www.oysterfestival.co.za) that usually runs around May/June and cause thousands of visitors across the country and globe to set upon this beautiful town. Knysna is also home to the well known Knysna Loerie as well as the Knysna Elephant. The Knysna Heads is a channel though which the sea pours in to flood the wide and beautiful lagoon at the mouth of the Knysna River. There is a path way that one can follow that will take you all the way to the edge of the heads. From here you will be able to marvel at the breathtaking views of the surrounded mountains and ocean. There are restaurants situated at the heads, where one can enjoy some delicious, freshly prepared sea food, while overlooking the beautiful lagoon. Plettenberg Bay is 50km from the town of Knysna, along the N2 towards Port Elizabeth. The Puzzle Park is situated just before you reach Plettenberg Bay. If you are one that loves word games and puzzles, this is the place to visit. Here you will find word games and puzzles for young and old alike, making it the perfect activity for the whole family. Some of the games includes two puzzle maizes., one of which is a human made 3D maize. The aim of the game is to find your way through the maize, by solving riddles along the way. It is loads of fun for the while family. There are some wonderful prizes to be won and there is even a small maize for children as well as a jungle gym. For more information, please visit: (www.plettpuzzlepark.co.za). About 20km just outside of Knysna on your way to Plettenberg Bay along the N2, you will find the Sunday Market. The market takes place every Sunday and is home to a variety of things. From jewelery, to African Art. From kids toys to cheese, bottled fruit, quilts, fresh fish and pate’s. If you are hungry, there’s tons of food stalls to fill the hunger tummies. You will even find a little tea garden where you can have a cup of tea/coffee with something sweet to eat. The market is only open on Sundays from about 07:00am until around 12:00pm, so make sure you are there early. The Sactuary is situated south of the N2, between Kysna and Plettenberg Bay. The interactive guided tours takes you through the wolf enclosures and is truly a unique experience that allows you to get really close and personal with these creatures. If you are liked and lucky, you could even get a gentle kiss from the semi tame wolf, Nalea. You will also find friendly wolf dogs and husky’s. You will also meet the various different “Wolf Packs”, wolf dogs, husky’s and Jackals in separate spacious enclosures. You will be able to interact with the variety of farmyard animals and the touchfarm. If you are hungry, there’s even a small restaurant that offers lovely breakfasts and other light meals. Yet, another great activity for the whole family. For more information on operating hours and fees, please visit their website. The Knysna Waterfront is a popular hotspot for tourists and locals alike, known and loved for its leisure activities, dining and spectacular views. It is also a shopaholic’s delight, as there is a number of fabulously unique shops to art galleries and specialty stores that caters or the needs and preferences of just about anyone. The Knysna Waterfront is also home to the Knysna Quays, which is the residential part of the waterfront, offering accommodation to visitors. The Waterfront is also the departure point for a number of yachts and cruising vessels that take visitors out of the lagoon and showcase the splendour of the Western Cape. Simply watching these boats drift on the water while sipping a cold beer is tranquil in itself. The life-size bronze stature of Bondi is always a treat to see. This English Bulldog was known for visiting Knysna on the HMS Verbena during the 1920’s and 1930’s. He was a resident on this ship and loved by its passengers. However, in 1931, he followed them onto shore and died of a heatstroke. They buried him on Thesen Island, and his statue remains as a reminder of his brave “sailor”. Why not end the day off with a sunset picnic on Leisure Isle. The lagoon is perfectly situated to provide visitors with views of the famous Knysna Heads which jut majestically out into the lagoon on the one side and the sea on the other. Laze on the beach and watch the sailboats and ferries across the blue waters. You can also take the opportunity to walk or cycle around the 4km island perimeter. The perfect way to end an eventful day with the whole family. This is just a small list of many activities to do in Knysna. When planning to visit Knysna, we suggest you stay in Knysna for at least a week to be able to appreciate all that this small town has to offer. For more information of the town of Knysna and the surrounds, please visit: (www.tourismknysna.co.za). Thank you for taking the time to read this article. Please share the love for this article, by sharing it with your friends and family. You can also show some love by following us on any of our social media platforms. If you have visited Knysna before and want to share your experience, please do so by commenting on this article. If you want to be informed when there’s new articles on the blog, please subscribe to our newsletter. The post All about Knysna on the Garden Route appeared first on Maros Travels. If you are the owner of Maros Travels | South African Family Travel and Reviews, or someone who enjoys this blog why not upgrade it to a Featured Listing or Permanent Listing?